Katie Bergin & Sean Burke represented the club in this highly regarded event on the irish athletics calendar. Katie was competing in the Ladies Junior 60mts and 200mts with Sean in action in the Men’s Junior 200mts. Competition was very competitive with national and international stars in action and indeed in her heat of the 60mts Katie had international athlete Patience Jumbo-Guala as a competitor and this heat saw three athletes qualify for the final, such was the quality on offer with Patience finishing second overall. Katie finished 5th in the heat in a time of 8.38. 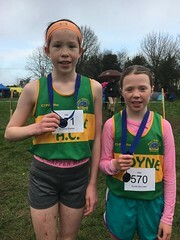 It was then on to the 200mts where again against strong opposition including the overall winner Davicia Patterson, Beechmount Harriers, Katie finished 4th in a pb of 27.20. Nothing easy in these championships! Well done Katie and there is certainly much to look forward to in your next championship outing. Sean also had to contend with top class opposition in his 200mts with over 20 athletes entered. Such was the competitive nature of his heat that two of the athletes qualified for the final of the event with Sean finishing 5th in a new pb of 25.16. Nothing like competition to get the best out of a person! Well done Sean on a terrific competition.